The company has cancelled plans for its hybrid cars to launch in India, after the government's tax reforms imposed heavy tax on them. Hyundai may launch its newly unveiled, all-electric Kona SUV in India, reports Autocar India. The company has reportedly been pegged back in its future endeavours for the Indian car market by the government's imposition of heavy tax on hybrid cars. As a result, it is considering abandoning its plans to bring mild and full hybrid cars to the Indian market, instead focusing on the all-new electric SUV, Kona. India is a massive market for SUVs, with all categories of SUVs seeing the largest growth as against other classes of cars. Adding that with the government's push for electrification of cars in India over the next decade and half, and it does make sense for Hyundai to become one of the early movers in the electric car segment by introducing an SUV that is solely battery-powered. Only Mahindra sells all-electric cars in India, with the e2o hatchback and e-Verito electric sedan. However, these cars have failed to raise considerable interest in the market, owing to the lack of charging stations across the country, the steep cost of the batteries that leads to a high-priced car which is otherwise quite average in terms of comfort and features, and of course, the lack of variety for conscientious car owners who are truly concerned about the pollution factor of combustion engines. The Hyundai Kona will be presented at the Geneva Motor Show 2018, and is now expected to be launched in India in the same year. The Kona is a tech-laden offering that brings together a new design along with a host of modern elements like assistive driving, augmented HUD and more. 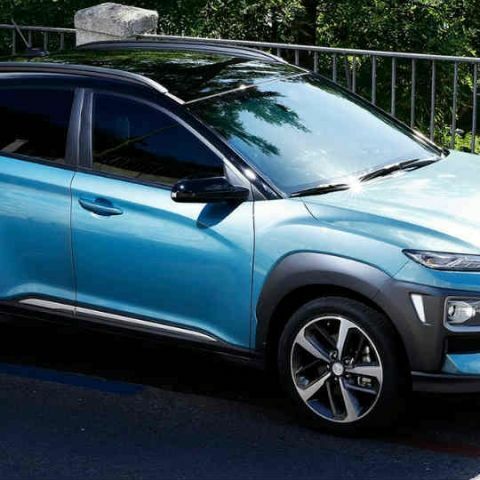 It is the second electric car in Hyundai's portfolio, after the Hyudai Ioniq sedan, and looks to be an interesting prospect for Hyundai to bring to India before potential rivals like Tesla join the party in India.